While the city will celebrate Holi on Monday, there are some steps which, if taken, can save the skin, hair and nails from damage. 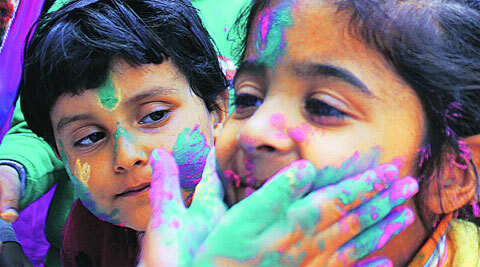 Holi was originally celebrated by throwing scented powder and perfume on each other. However, now industrial dyes and harmful chemicals have taken the place of natural colours which can damage the skin beyond repair. “The biggest problem for people is that they have no control over what the person on opposite side will use and thus one should take some precautions. Apply oil or moisturiser all over your skin and allow it to be absorbed by the body for 15 minutes. Next, smear waterproof sunscreen on your skin. Soak your hair liberally with hair oil so that all colours slide away when you sit down to remove them after the day is over. Wear clothes that can cover maximum part of the body. Use Vaseline for your nails,” he says. One should prefer red or pink colours because they can be easily removed as compared to colours like yellow, green, orange or dark purple as they have comparatively more harmful chemicals in them. While playing with colours, ensure that your eyes are protected all the time, he adds.